James Wellbeloved Kitten is a tasty wet food in convenient pouches. It is suitable for all kittens and growing cats, especially those which suffer with allergies and nutrient intolerances. 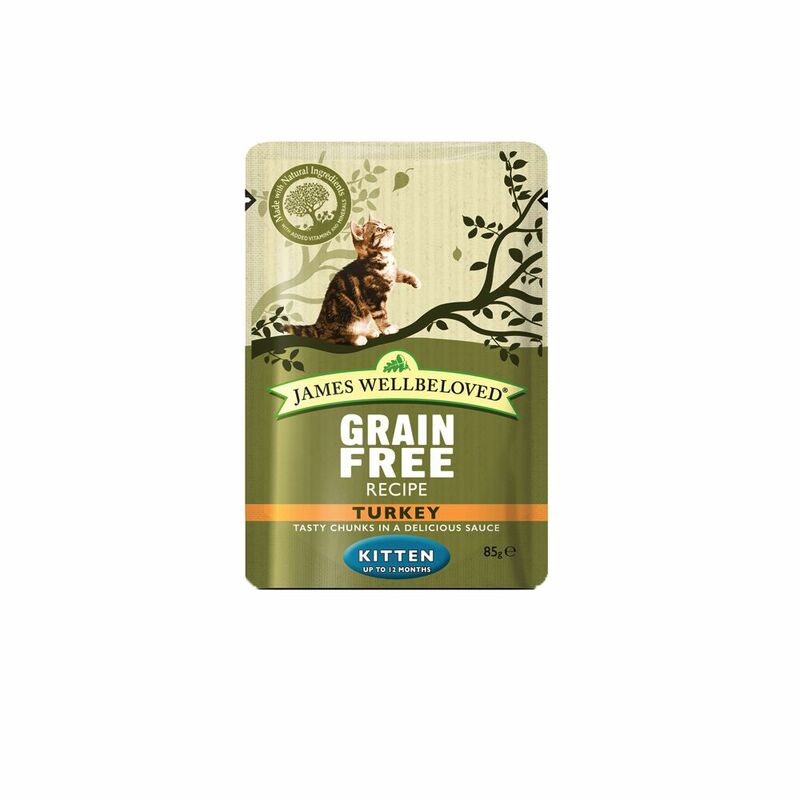 This hypo-allergenic cat food is made with only turkey as a single source of animal protein. It has only selected carbohydrate sources (potato, caΒava) and is wheat, gluten and soya free. It doesn't contain added artificial colours or preservatives and also avoids ingredient known to cause many food intolerances such as pork, eggs, dairy and beef. Healthy linseed oil provides lots of unsaturated fatty acids to help to support healthy skin and shiny fur. Chicory extract provides prebiotic inulin which is good for your pet's digestive system and helps to maintain a balanced gut flora. Yucca extract can help to reduce stool odour. This delicious moist food uses only the very best, top quality natural ingredients and is enriched with vital minerals and vitamins. James Wellbeloved Kitten comes in convenient pouches and provides your little cat with a tasty, easy-to-digest, wholesome meal: Balanced complete food: For kittens and growing cats, especially those with sensitive tummies Mono protein: Only contains one source of animal protein Hypo-allergenic: Easy to digest, well accepted Grain and gluten-free: Only potato and caΒava as a source of carbohydrate Carefully selected, natural ingredients: Premium quality for a great taste Linseed oil: Provides important omega-3 and omega-6 fatty acids to help keep skin healthy and fur shiny Yucca extract: Reduces stool odour Prebiotic inulin: Chicory extract provides important inulin which can help to improve the balance of gut flora. It reduces bad gut flora while improving good gut flora. Minerals and Vitamins: For a balanced, holistic cat nutrition Excludes the most common causes of adverse food reactions. No beef, pork, soya, wheat, wheat gluten, dairy or eggs Free from: Artificial preservatives, colours or taste enhancers, no bulking ingredients James Wellbeloved avoids using many of the ingredients renowned for causing food intolerances. This means James Wellbeloved cat and dog food and treats do not contain beef, pork, wheat or wheat gluten, dairy products, eggs or soya. Price just £24.99! Click here to buy now!